Super Hero Boy: Thinking ahead to thanksgiving. If all goes well we won't be home for Thanksgiving. The plan is to leave our warm sanctuary that is the south and drive 12 hours north to the frigid weather to spend a glorious Thanksgiving with Chris's parents. It's a very special Thanksgiving as it will most likely be our last glimpse of Chris's family home. His parents are retiring and moving to the lake and the hold house will go up for sale soon. Not to mention we absolutely miss everyone and it will be great spending some time with everyone up north and seeing my adorable nephew for the first time. However, I have been thinking about cooking us a pre Thanksgiving dinner with our new Frigidaire stove. I mean it seems such a shame not to as the stove was born to cook a big meal. Of all the things I can cook, the one thing I really excel at is cooking an amazing turkey. Quite possibly because I'm really passionate about turkey in general. Nothing and I do mean NOTHING is better than a great turkey with homemade southern style corn bread stuffing and cranberry sauce. Forget thanksgiving all together I could eat it once a week. Actually before I had a toddler attached to my leg almost 24 hours a day I did cook at least the turkey part once a month. Up till now the big problem has been the fact that I had to cook the turkey all by itself as my old stove would not fit a turkey plus dressing in the oven at the same time. This is not even remotely an issue with my new Frigidaire gallery range. Seriously I'm still not so sure how it all works as the new stove is no bigger than my old stove.. but with the addition of more shelving and the fact that I can use the drawer underneath as a warming drawer I've yet to even remotely run out of space. Seeing as we are about to be a family of four in just a few months I'm really appreciating the fact that I can make a large meal all at the same time and keep anything done early warm in the meantime. Not to mention that my amazing husband works third shift and we sometimes eat at odd times so keeping a meal warm is usually one of my biggest challenges. The Frigidaire gallery range not only has an heating drawer located under the stove but there is a fifth burner on top of the stove which is a heating zone for pots you need to keep warm as well. Lets not forget that the microwave has warming capabilities as well! I actually took some photos of exactly how many pots and pans would comfortably fit into my stove and on my cook top. Mind you my turkey pan is currently in Florida as my mom uses it to make our turkey every year... but the space in the bottom would easily fit the full sized turkey pan I have as well. So just pretend its there. heh. 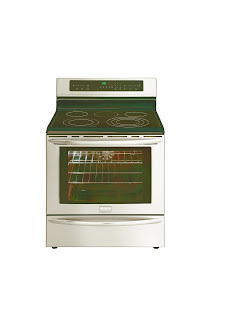 Check out the entire line of Frigidaire appliances on their website. Don't forget that Frigidaire offers the “More Me Time” guarantee!